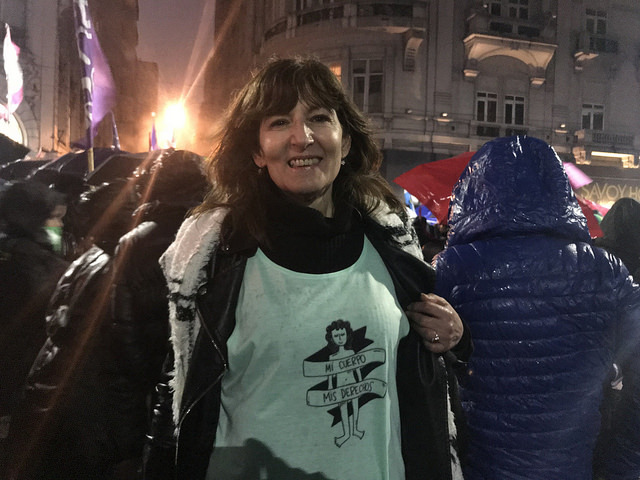 BUENOS AIRES, Aug 23 2018 (IPS) – The Argentine Senate’s rejection of a bill to legalise abortion did not stop a Latin American movement, which is on the streets and is expanding in an increasingly coordinated manner among women’s organisations in the region with the most restrictive laws and policies against pregnant women’s right to choose. In the same period, the region had the highest rate of unintended pregnancies in the world: some 14 million, 46 percent of which end in abortion, according to the Guttmacher Institute, which advocates for women’s reproductive rights, in line with World Health Organisation (WHO) principles. “Actually, it was politics that lost, because here, while society was discussing, talking and joining the green wave (the colour adopted by supporters of the legalisation of abortion), most of the political parties did not flinch,” Dr. Mabel Bianco, a feminist who presides over the Argentine Foundation for Studies and Research on Women (FEIM), told IPS. “I think that although the impact of the green tide is less than if the law had been approved, the impact it has had on other countries will be felt and will help get laws passed; it will even revive alliances with parliamentarians and journalists. I’m sure it will yield fruit in several countries,” she said. In Latin America and the Caribbean, abortion is only legal in Cuba, French Guiana, Guyana and Uruguay, as well as Mexico City, while in the rest of the region “therapeutic abortion” is only allowed in specific circumstances such as those of Argentina. This entry was posted on Thursday, August 30th, 2018 at 00:03	and is filed under Uncategorized. You can follow any responses to this entry through the RSS 2.0 feed. Both comments and pings are currently closed.